The base rate for this trip is good for up to 2 adults. 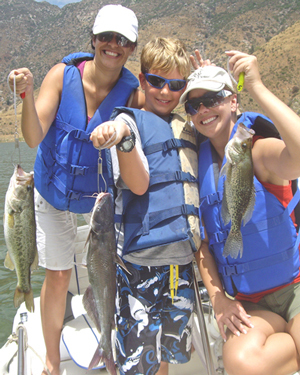 Fishing San Diego Area Freshwater offers lots of adventuresome choices. Whether you fish San Diego Area Freshwater lakes; ponds, rivers, or creeks, you are sure to have an adventure to remember. If you chase Bass; Trout, Catfish, Panfish, Stripers, or Carp, we have something somewhere in the greater San Diego area to fulfill your freshwater fishing need. Price includes lake permits and fees. James Nelson Professional Fishing Guide Service will not only guide you to the best fishing San Diego Area Freshwater has to offer, but we also supply you with all the necessary baits; lures, tackle, rods, reels, snacks, and soft drinks, to help make your San Diego Area Freshwater fishing trip that much better. Captain James Nelson has been fishing San Diego Area Freshwater for over 30 years. Fish with James once, and you will never fish San Diego the same. Some of the best freshwater options in San Diego: Lake Cuyamaca, Lake Dixon, Doan Pond, El Captitan Reservoir, Green Valley Falls, Lake Hodges, Lake Jennings, Lake Morena, Loveland Reservoir, Otay Lakes, Poway Lake, San Diego River, San Vicente Reservoir, Sweetwater Reservoir, and Lake Wohlford. Due to the inconsistent water levels, and the poor fisheries management of San Diego County, I cannot guarantee anybody will catch fish on our lakes. We will do the best with what we have, and have fun doing it.